October 24, 2011  The oil tanker S.S. Montebello was sunk by a Japanese submarine during World War II off the coast of California. A recent expedition to the wreck found that oil believed to still be in the ship is not there. It's full of seawater. It's the Al Capone's vault of the sea, if you will. Former Massachusetts Gov. Mitt Romney (left) and Texas Gov. 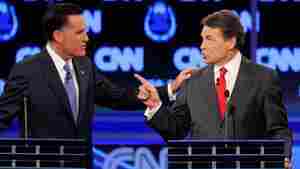 Rick Perry got into a heated exchange about immigration during Tuesday's GOP presidential debate in Las Vegas. October 20, 2011  At the Western Republican Leadership Conference in Las Vegas, about 600 die-hard Republicans were considering their options. Mitt Romney may be the presumed front-runner, but most activists mention his name as just one possibility. Conservatives continue to look for other options. 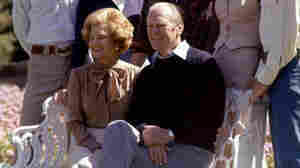 Herman Cain (left) watched as former Massachusetts Gov. Mitt Romney (center) and Texas Gov. 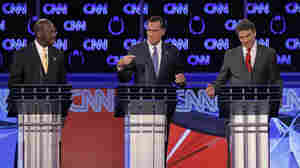 Rick Perry spoke during what became a heated Republican presidential debate Tuesday night in Las Vegas. October 19, 2011  Republican presidential candidates took turns explaining why they think Herman Cain's 9-9-9 plan is really a big zero. And Mitt Romney and Rick Perry swapped criticism in unusually personal and biting terms. 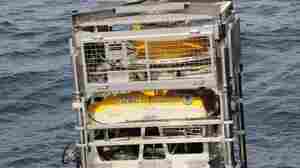 An unmanned ROV (remotely operated vehicle) is launched 900 feet underwater to study the wreckage of the SS Montebello. October 18, 2011  More than 3 million gallons of crude oil from a sunken tanker may be threatening California's Central Coast. The SS Montebello sank in 1941 after it was torpedoed by a Japanese submarine. A group is now trying to determine just how much of an environmental threat the Montebello poses, 900 feet below the waves. September 28, 2011  New Jersey Gov. 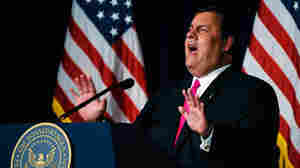 Chris Christie has repeatedly said he does not plan on running for president in 2012. That hasn't quashed speculation that he'll reconsider. And nothing Christie said during an appearance at the Ronald Reagan Library in California seemed to dampen the hopes of his fans. September 26, 2011  The 2012 presidential election is more than a year away, but that's not keeping political advertisers from targeting the TV airwaves. However, a survey has found that the TV audience is shrinking — especially the young voters. September 18, 2011  From a back-of-the-pack start, the Tea Party favorite won an upset victory in the Iowa straw poll but lost ground when Texas Gov. Rick Perry got in the race. A feisty debate put her back on an upswing, but how long she can keep that momentum remains to be seen. September 14, 2011  California is a solidly Democratic state, but the campaign coffers of many Democratic officials are hovering near empty. The reason: They were allegedly ripped off by a campaign treasurer who handled hundreds of accounts. One congresswoman called her the "Bernie Madoff of campaign treasurers." September 8, 2011  Eight Republican presidential candidates gathered Wednesday night at the Reagan Presidential Library in California for a debate. It was the debate debut for Texas Gov. Rick Perry. He's overtaken former Massachusetts Gov. Mitt Romney in national polls. 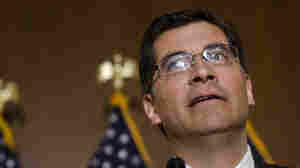 August 22, 2011  Before Congress created a supercommittee tasked with finding a way to slice $1 trillion from the federal deficit, California Democratic Rep. Xavier Becerra said Social Security should be protected. Now that he's on the panel, he's going to have to work with Republicans who might not agree. August 7, 2011  When Standard & Poor's downgraded the U.S. credit rating, it cited a lack of bipartisanship as one major reason. Lawmakers' reactions to S&P's move, at least on the Sunday news talk shows, may have illustrated that point. August 4, 2011  Los Angeles County supervisors are refusing to turn over subpoenaed records involving the deaths of youngsters under supervision by the Department of Children and Family Services. The state auditor, who is also looking at child deaths in Alameda, Fresno and Sacramento, says L.A. county's refusal is a crime. The Legislature ordered an investigation into the L.A. county deaths earlier this year after a Los Angeles Times report found that more than 70 children have died since 2008 of abuse or neglect after coming under the purview of county social workers. July 21, 2011  Thousands of assaults occur each year at California's state psychiatric hospitals. Last year, a staffer was killed at Napa State Hospital. Employees there demonstrated, demanding greater safety. 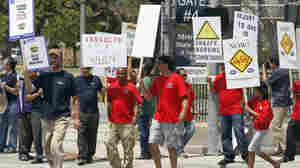 Now, protests have spread to a hospital near Los Angeles, where workers say it's not if you get assaulted, it's when. July 8, 2011  Former first lady Betty Ford was an advocate for women's rights and an inspiration to people struggling with addiction. She died on Friday.